Casual dinnerware in bright colors will start your day with a smile. Dinnerware with a casual, modern flair. To complete your table setting: crystal stemware, sterling silver or stainless flatware, and table linens. Casual dinnerware to add charm to any meal of the day. Bring new life to casual dinnerware settings. Versatile enough for both casual and elevated dining, this classic dinnerware is updated with a subtly etched motif. Glazed stoneware. Dishwasher and microwave safe. With a nod to vintage dinnerware, this bowl brings timeless elegance to your modern table. Glazed fine stoneware. Dishwasher and microwave safe. With a nod to vintage dinnerware, this bowl brings timeless elegance to your modern table. Glazed fine stoneware. Dishwasher and microwave safe. Sets of four. Handpainted and glazed porcelain. Dishwasher and microwave safe Hand-painted Earthenware dinnerware. 16-piece set. Made in Portugal Featuring a playful twist on classic tile motifs, this modern dinnerware lends an eclectic touch to your tablescape. Characterized by a subtly satin glaze, this matte dinnerware retains a buttery finish and a tactile hand-feel that reads as refreshingly contemporary - and its organic curves make home-cooked meals look all the more inviting. Dishwasher and microwave safe A multi-disciplinary artist and textile designer based in Hackney, East London, Alicia's expressive practice draws inspiration from everyday surroundings and observations - the process of gathering objects, imagery, textiles, and sketches informs the instinctive, reductive manner of her work. A bold, abstract motif accented with gold linework lends a luxe, modern touch to any tablescape. Reactive Glaze Dinnerware with exposed Terra Cotta Bands and beautiful hand painted details. Embellished with reactive glazing effects and embossed flourishes, the Laurie Gates Trapani dinnerware service for four adds versatility and a rustic-inspired ambiance to modern dining and entertaining. A reactive glaze on hard-fired terracotta and embossed trim gives the Gibson Valencia Teal dinnerware a crafty look that creates a handsome tablescape. Signature Coton Colors ruffle shape. Designed in Tallahassee, Florida, Coton Colors products inspire a lifestyle committed to never missing an opportunity to celebrate every day. Designed in Tallahassee, Florida, Coton Colors products inspire a lifestyle committed to never missing an opportunity to celebrate every day. Sets of four. Crafted of dolomite. Designed in Tallahassee, Florida, Coton Colors products inspire a lifestyle committed to never missing an opportunity to celebrate every day. Porcelain dinnerware. Service for four includes dinner and salad plates and bowls. Dishwasher safe; not suitable for use in microwave. Made in Portugal. Red Vanilla is a great night out and a quiet night in. It's dinner with friends in high fashion. It's vibrant, crisp, defined, and coherent in its simplicity as a concept. Red Vanilla is a lifestyle, an all encompassing array of sophistication intended to Blanket your existence with the quality and design that you expect to live in. Handcrafted dinnerware service. Service for four. Earthenware and glaze. 12-piece set. Made in Portugal. 12-piece porcelain dinnerware service. Service for four. Dishwasher and microwave safe. Made in Portugal. Hotel Collection's Modern Bisque Dinnerware Collection brings versatile pieces in a contemporary bisque tone and subtle styling for a sophisticated accent to your next dinner party. Porcelain dinnerware set. Classic and timeless range. Dishwasher and microwave safe. Made in Portugal. The rich, warm hue of the Vanilla Hampshire collection exudes the natural color of the earth while a strong dark band on the rim of each piece frames any meal beautifully. Vanilla Hampshire gray offers a soothing alternative to brighter patterns. A little bit country. Made for the rigors of daily use but with an embossed design that's entirely graceful, American Countryside dinnerware from Mikasa promises well-balanced dining in classic white stoneware. A classic symbol of hospitality accents the Godinger Pineapple dinnerware set that features borders repeating the fruit's tropical leaf motif. Made of porcelain. Salad plates and soup bowls feature four different designs; dinner plates are all alike. Dishwasher and microwave safe. World-renowned chef Gordon Ramsay presents his striking new collection, Bread Street Kitchen, a modern design that lends itself to the casual dining style for which Bread Street Kitchen is loved. The tableware is perfectly proportioned for every meal and the serving pieces are intended for both individual portion sizes or to share. Porcelain dinnerware. Hand painted and hand glazed. Dishwasher and microwave safe. Earthenware. Service for 4 includes dinner plates, salad plates, and bowls. Dishwasher and microwave safe. Capture the essence of Tuscany. The Siena Collection by Mikasa features bold hand-painted details over clean white earthenware, making it an irresistibly rustic choice for casual dining. Designed for your healthy casual lifestyle, the Kara dinnerware service for four from Tabletops Unlimited features a versatile and pretty floral pattern on porcelain made without whiteners or additives. Versatile and casual, it's a family-friendly collection suited for breakfast, dinner, and every meal in between. Here, our Daisy Dinnerware boasts impeccable, thoughtful design, complete with a delicate finish. Glazed stoneware. Dishwasher and microwave safe Earthenware dinner service colored and glazed. Made in Italy. Classic style, modern convenience. The Paloma Embossed dinnerware set is big on elegance with service for six plus extra bowls crafted of versatile white porcelain. A subtle pebbled effect and rich reactive glaze bring a comfortable ambience to the versatile stoneware pieces in Gibson's Ravenna dinnerware set. Richly glazed concentric circles, capped off with rustic edges, add artisan-style appeal to Gibson's Mariani Blue stoneware dinnerware set. The clean shapes, reactive glaze and handpainted details of the Gibson Laurie Gates Potenza stoneware dinnerware set bring a fresh look to your table that's ideal for casual dining and entertaining. 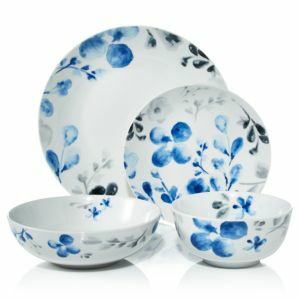 Denby Azure Haze Coupe set includes 4 dinner, 4 salads, 4 bowls and 4 mugs. Stoneware. Dishwasher Safe. Made in England Freshen up your casual tablescape with the modern embossed edge motif and tonal cream glazing of Pfaltzgraff's Amelia Cream dinnerware service for four. A reactive glaze on hard-fired terracotta and embossed trim gives the Gibson Valencia Teal dinnerware a crafty look that creates a handsome tablescape. Create a rustic farmhouse look with this subtle paint distressed dinnerware set. Service for 4. Impressionist watercolor floral pattern. Porcelain. Dishwasher- and microwave-safe Hotel Collection's Modern Dinnerware Collection brings versatile pieces in a contemporary and subtle styling for a sophisticated accent to your next dinner party.